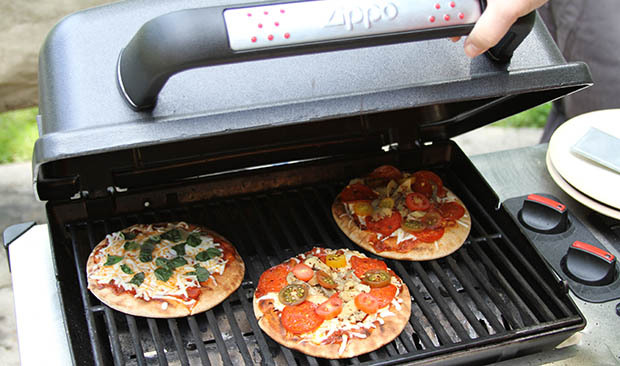 Personal Pita Pizzas on a Zippo All-Terrain Grill. 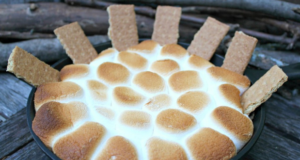 Too hot for a campfire? Yes, it may sound like heresy, but some of these sweltering summer days, it is just too darned hot for a campfire! Who wants to kindle, build, light, and tend a campfire when it’s 90 degrees and overwhelmingly humid? 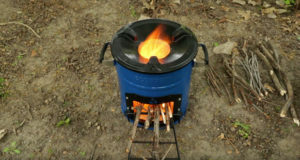 And then to have it pumping out heat into your campsite … all … day … long? Ouch! 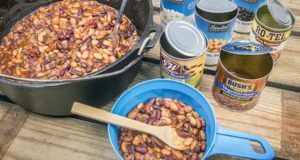 Yet your camping crew still wants to eat delicious meals cooked outdoors. We offer the less than 10-minute solution with these five quick grilling recipes to beat the heat. 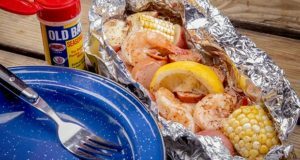 With these quick grilling recipes (and those they inspire you to create on your own) you’ll be able to haul out the portable gas grill, hook up the 1-pound propane bottle, fire it up, cook, and turn it off in 10 minutes — total! Yet these meals will taste like you slaved away all day, sweating over the hot coals. There are no crazy ingredients or any special gear required either. We used the self-contained, portable Zippo All-Terrain propane grill that goes on most every camping outing with us. 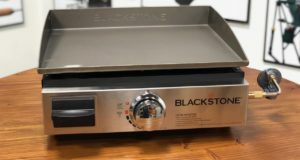 On some of the recipes we also used the Twisted Chef Grill Mat. 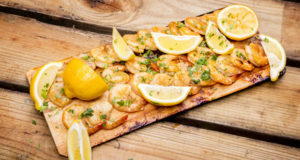 You don’t have to use a grill mat, but it keeps small foods like shrimp from falling between the grates. A grill mat takes up ZERO space in your camp cooking kit, and offers big convenience in making sure food doesn’t stick to the grill grate. 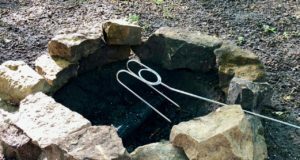 Not to mention, keeping your food from touching that disgusting, who-knows-when-it-was-last-cleaned-if-ever grill grate on the public grill at the park or campground. These are easy, fast, and everybody gets a personal pita pizza that exactly suits their own tastes. The toppings you offer are limited only by your imagination! HERE'S THE SECRET THAT MAKES THIS SUPER-FAST! Put the pitas on the grill as it's heating up to toast your "crusts." When the grill is up to about 350-400 F with the lid closed, remove the pitas from the grill and place with the toasted sides up on individual plates. Each pita gets a nice smear of tomato sauce and well-sprinkled with cheese. Then each person gets to add the toppings they want. 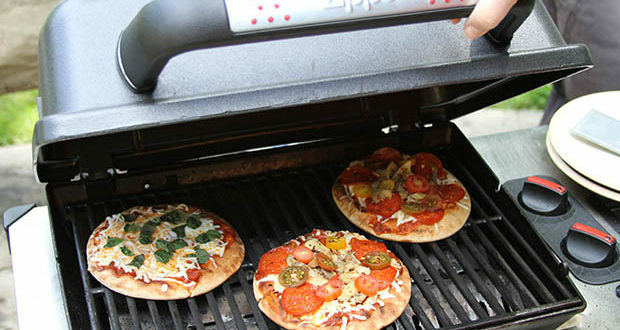 The pizzas then go back on the grill and the lid is closed. Watch carefully until the cheese is nicely melted -- about 4-5 minutes. For those who like especially crispy crust, turn off the grill and let the pizzas sit under the closed lid for another minute or two. 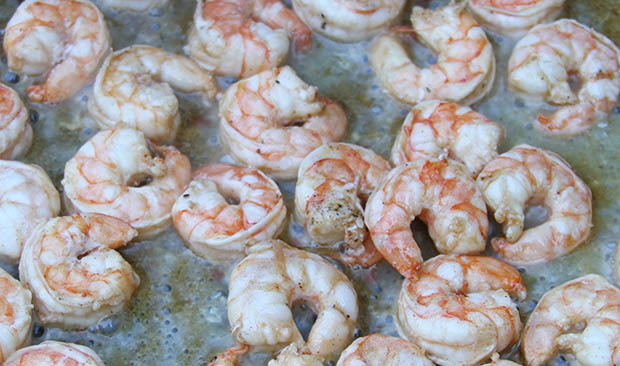 Marinate a pound of medium sized shrimp for about two hours before you're ready to fire up the grill. On a grill mat these delights will cook in about six minutes ... OR LESS. Don't walk away, because you don't want to overdo them. Delicious "super fast food" for hot weather. Warm vinegar, catsup, and bourbon in sauce pan on stove. Warm together (not boiling) for 10 minutes. 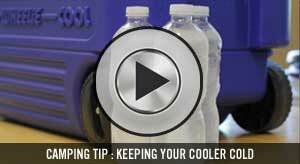 Allow to cool slightly, then store in bottle with tight fitting lid in refrigerator. Shake occasionally over 1-2 days before using. Stores for two months plus in refrigerator. 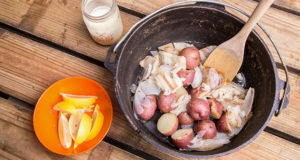 Use as North Carolina-style BBQ sauce or marinade as in this recipe. Drain shrimp and place in zipper storage bag. Add olive oil and 1½ Tbsp. of BBQ/Marinade. Put back on ice and allow to marinate for at least two hours. 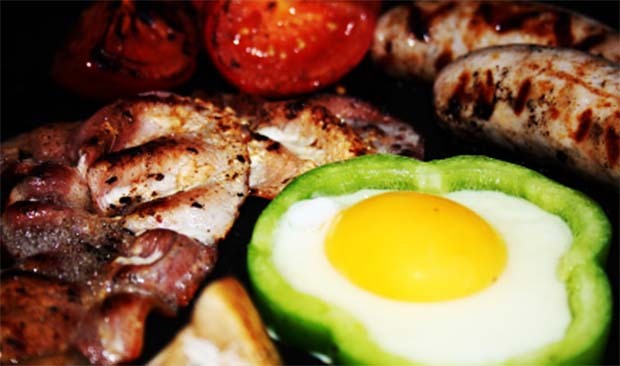 Place grill mat on grill. Spray cooking oil on mat. Using tongs to let shrimp drip off in bag, place single layer on grill mat. Grill until underside is pink (less than 3 minutes). 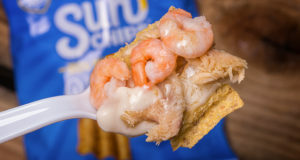 Take the shrimp off and serve hot or cold with cocktail sauce. 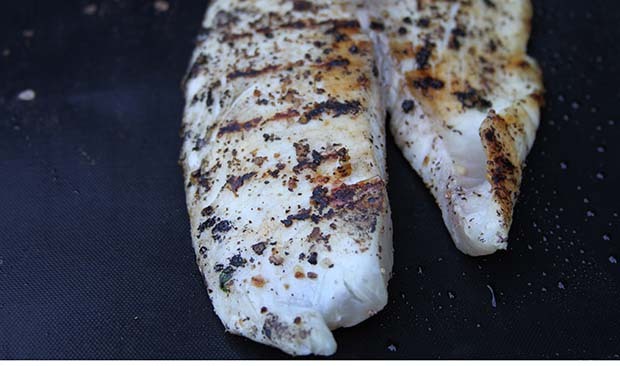 Boneless, skinless chicken breast is a natural for fast grilling. Pound them or slice them thin and they are nearly done as fast as you can turn them. You want internal temperature to reach 165 F for safety, but not much higher as they will dry out. Best way to check when you think it's ready is to slice the thickest piece in half. If the pink's gone, it's ready. Any marinade will do, but this Kalbi style recipe is easy and made from ingredients you probably already carry in your modern camp cooking kit. Mix all ingredients in a large zipper top bag. Kneed the bag to work in marinade. 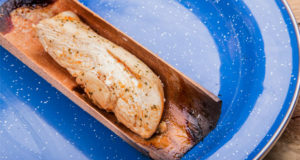 Allow to marinate at least two hours and up to 24 hours is fine. Heat grill to 350 F.
TIP: Using a grill mat prevents any marinate from dripping on burner and causing flare ups. Mat also prevents breast sticking to grate. For some nice grill marks, just cook directly on grate for last minute. Almost not worth a "recipe", but in sweltering hot weather sometimes you need some inspiration. This one is as delicious as it is fast and easy. 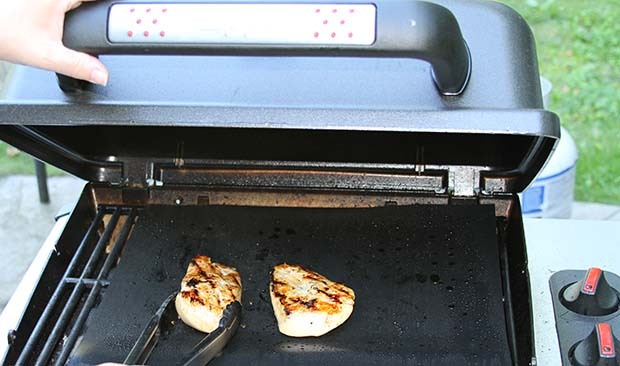 Grill mat is a huge help here because when fish is flakey, with the grill mat you don't have to worry about losing any of it through the grill grate. 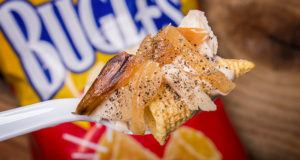 Works with any kind of white fish, but we used tilapia. Season both sides of filet with lemon pepper and salt. Heat grill with grill mat to 350-400 F.
Spray mat lightly with cooking oil. Cook 2-3 minutes on first side and flip. Cook on second side until filet flakes easily at touch of spatula. 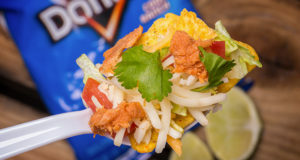 This one came from the Twisted-Chef.com website. 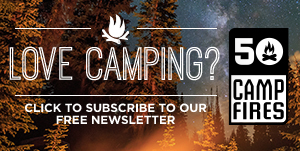 Yes -- you can cook a fried egg on a gas or charcoal grill at your campsite, if you have a Twisted Chef grill mat. No fry pan to clean up. Lay bell pepper on its side and slice four rings about ⅜-inch thick from center of pepper. Keep rings intact. Remove seeds and pith. Heat grill to 350 F with grill mat in place. Spray lightly with butter flavored cooking oil. Space pepper rings on mat. Carefully crack one egg into each pepper ring. Once white starts to solidify, you can even flip with spatula for over easy, medium, or hard if you like. Plate each egg in its pepper ring.